Forests in five provinces of Viet Nam are getting smaller and smaller. This is because people chop them down to make farms. People are now beginning to think that the laws which are in place to protect Viet Nam's forests should become more strict. A survey is a study that is done based on careful counts and interviews. If a survey reveals something that has happened, it tells this from the answers it produces. Exploitation means getting as much as possible out of something. Deforestation means the destruction of forest cover. You have an economic target when you aim to make a certain amount of money. Ngai added that the backward policies and mechanisms for forestry management and use were also reasons that had led to instability in the lives of forest protectors and people living near the forest. A policy for forestry management is a thought out way of dealing with things to do with forestry. The mechanisms for forestry management are the processes that are practiced in forestry management. When there is instability, things are out of control. 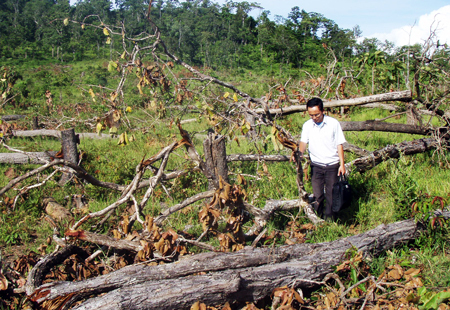 The Dak Lak People's Committee's Deputy Chairman, Y Dham Enuoi, said the province's forest area had been reduced by more than 86,000 ha over the past decade. Ineffective implementation of many projects had led to a situation of land conflict or illegal forest exploitation of the local people. When there is ineffective implementation of a project, it means that the project is simply not done well enough. Comprehensively means taking everything into account and not forgetting about a single aspect. Dissemination of laws means to spread the law to include more aspects of forestry. 1. There is 360,000 hectares less forest cover in the five provinces than there was seven years ago. 2. Gia Lai is a province in the central highland region of Viet Nam. 3. Nguyen Ba Ngai is deputy chairman of the Dak Lak People's Committee. 4. Hoang Trung Hai is the deputy prime minister. 5. There was nearly nearly 2.6 million ha of natural forest covering the Central Highlands only three years ago. 1. True; 2. True; 3. False; 4. True; 5. True.